Assam Urban Infrastructure Investment Program, Assam. 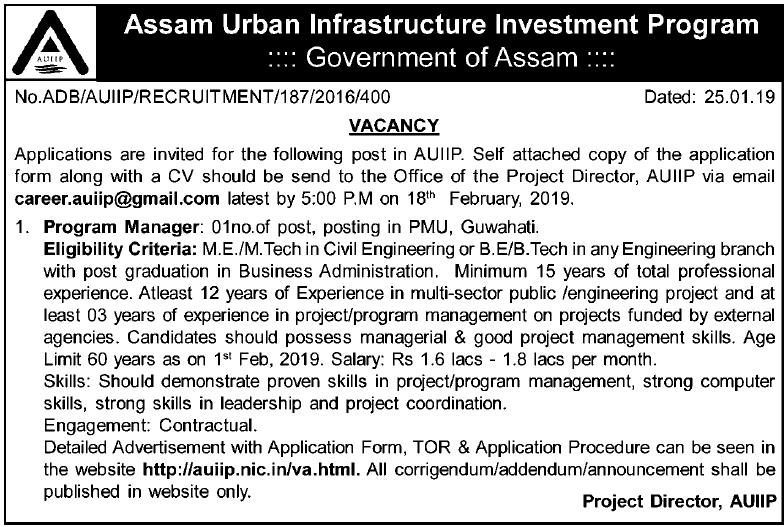 Applications are invited for the following post in Assam Urban Infrastructure Investment Program (AUIIP), Government of Assam. No of posts: 01, posting in PMU, Guwahati. Eligibility Criteria: M.E./M.Tech in Civil Engineering or B.E/B.Tech in any Engineering branch with post graduation in Business Administration. Minimum 15 years of total professional experience. Atleast 12 years of Experience in multi-sector public /engineering project and at least 03 years of experience in project/program management on projects funded by external agencies. Candidates should possess managerial & good project management skills. Age: 60 years as on 1st Feb, 2019. Pay: Rs 1.6 lacs - 1.8 lacs per month. Skills: Should demonstrate proven skills in project/program management, strong computer skills, strong skills in leadership and project coordination. How to apply: Self attached copy of the application form along with a CV should be send to the Office of the Project Director, AUIIP via email career.auiip@gmail.com latest by 5:00 P.M on 18th February, 2019.